Marcos Giráldez de Acosta painting (1864) depicting the "Santa Gadea Oath". In the middle of the scene, Alfonso VI (with red cape) is swearing with his right hand on the Bible that he did not take part in the murder of his brother Sancho II, while El Cid stands as a witness in front of him. 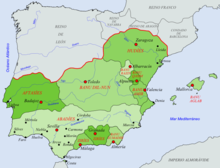 El Cid married Jimena Díaz, who was said to be part of an aristocratic family from Asturias, in the mid-1070s. The Historia Roderici calls her a daughter of a Count Diego Fernández de Oviedo. Tradition states that when El Cid first laid eyes on her, he was enamoured of her great beauty. El Cid and Jimena had two daughters and a son. The latter, Diego Rodríguez, was killed while fighting against the invading Muslim Almoravids from North Africa at the Battle of Consuegra in 1097. As both the Poem and Chronicle state, Cristina Rodríguez and María were originally married to the Infantes de Carrión along with the generous wedding gifts of his two famous swords, Tizona and Colada. However, in revenge for an incident that the Infantes blamed El Cid for, they tied their wives to trees and left them to die. El Cid saved their lives and avenged himself upon the Infantes, and found them more favorable husbands. Cristina Rodríguez, (known as Elvira by the Poem and the Chronicle) married Ramiro, Lord of Monzón and grandson of García Sánchez III of Navarre. Her own son, El Cid's grandson, would be elevated to the throne of Navarre as King García Ramírez. 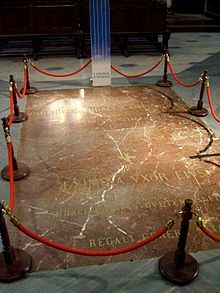 The other daughter, María (also known as Sol), is said first to have married a prince of Aragon, presumably the son of Peter I, and she later wed Ramon Berenguer III, count of Barcelona. General view of the 1954 Juan Cristóbal González Quesada's statue of El Cid in Burgos. Another copy of Huntington's El Cid statue in Buenos Aires. Statue of El Cid included in the 14th century-15th century "Santa María" gateway, Burgos. 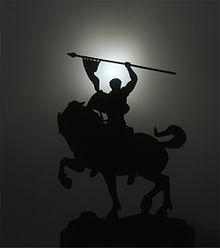 In 2008, this El Cid statue made by Ángel Gil Cuevas was placed in Mecerreyes, at the path of the "es:Camino de El Cid"
El Cid depiction on the book "Portraits of illustrious Spaniards" (1791). 1864 Juan Vicens Cots painting "La Primera hazaña de El Cid" depicts a young Rodrigo Díaz showing his father Diego Laínez the severed head of Count Lozano, the father of his future wife Doña Jimena. Count Lozano had previously mocked and slapped elderly Diego Laínez. 1344 medieval miniature showing the decapitation of Count Lozano by El Cid. Another version of the "Santa Gadea Oath", painted by Armando Menocal in 1889. El Cid portrait from "The Historians' History of the World". Burgalese traditional representation (called "Gigantones") of El Cid that is taken to the streets during the town major festivity. Doña Jimena's representation is behind. El Cid's chest at Burgos Cathedral. The terrain known as the "Solar del Cid", where his house was located. The monument was erected in 1784. Photo taken in Burgos, ca. 1865–1892. ^ Barton, Simon; Fletcher, Richard. The World of El Cid. Manchester University Press. p. 90. ISBN 9781526112637. Retrieved 23 April 2019.